Cedar Fork Landscaping is an experienced, family owned, and a fully licensed, insured and bonded landscape and irrigation contractor. We've been serving the Raleigh, Cary and Durham area with pride since 1975. With the addition of a Morehead City location, we are also able to serve Atlantic Beach, Beaufort, Emerald Isle, and other surrounding coastal areas. 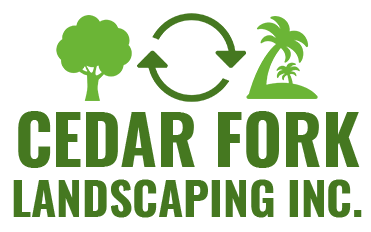 Cedar Fork Landscaping provides a wide range of landscape and irrigation services, including: installation, lawn maintenance, irrigation, drainage, landscape lighting, aeration, mulch, pine straw, plants, sod, seed, hardscaping (patios, walls and walkways). We are a family owned and operated business serving the Raleigh, Cary, Apex, Morrisville and RTP area since 1975. We're a reliable irrigation company in Cary, NC and we now have a location in Morehead City, NC. Cedar Fork Landscaping Inc. is an experienced lawn care services provider in Cary, NC & Morehead City, NC. We've been helping property owners with their lawn maintenance and landscaping needs for over 35 years. Whether you need help aerating your lawn, fertilizing & seeding, or installing a custom outdoor hardscaping feature, you can count on us to take care of it. Our promise to you, "We deliver dependable, reliable, reasonably priced landscape services to every one of our valued clients". Personal, professional and prompt customer service is the key to our success for over 40 years. Call today to schedule the landscaping services you need. To reach us in Cary, NC contact Tony Chiotakis at 919-812-2724. To reach us in Morehead City, NC contact Nick Chiotakis at 252-646-7454. Need help in the Raleigh area? We operate a separate service for homeowners in Cary and other suburbs. To find out more about the lawn care services we offer in your area, contact Cedar Fork Landscaping today. Cedar Fork Landscaping is prepared to handle all your landscaping needs in Cary, NC & Morehead City, NC. You can trust us to design, install and maintain your landscaping for you. We make it easy to create a yard that you'll love, and your neighbors will envy. Contact us today to schedule lawn maintenance services. Copyright © 2019 Cedar Fork Landscaping Inc., all rights reserved.